I was contacted by a Bic representative a few weeks back and was asked to review one of their new products: Brite Liner Highlighter Tape. I graciously said yes and they sent a whole class set of highlighters for our class to try out for free! We have been working on constructing support. We have been highlighting supporting details from within a text, using the lovely constructing support graphic organizer mentioned in the Common Core, and forming detailed responses to text-based questions. 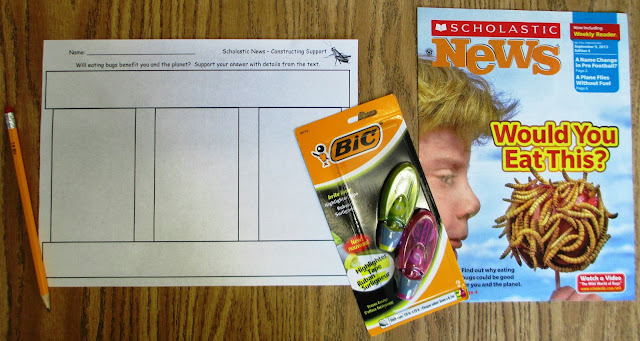 Since we are still spending a good chunk of our time modeling and practicing reading center procedures, I've been trying to keep the text we use during guided reading short and sweet. I LOVE Scholastic News. One of their most recent articles is about eating bugs? How cool is that? I can't think of a better way to spark student engagement than looking at the cover of Scholastic News with a real life photo of a bug covered candy apple. So, together, with our Scholastic News and constructing support diagram in one hand, Bic Highlighter Tape and pen in the other, we dug in deep to this fascinating text on bug eating. We previewed the article and discussed our initial thoughts, reactions, predictions, and questions we had. Then we read the whole article through once to understand the flow and overall tone of the passage. We looked at the question/task that accompanied our constructing support diagram: "Will eating bugs benefit you and the planet?" After taking a few moments to discuss our opinions, students determined that, "Yes, eating bugs would benefit people and the planet." Our next task was to find details in the article to support our answer. Students reread the article and highlighted the evidence within the text. We took some time to discuss the supporting evidence students highlighted and used it to fill out our graphic organizer. These innovative highlighters add vibrant highlights in either yellow or pink and provide the ability to erase after use. Students were extremely motivated to highlight with these fun highlighters. Want to know the best part? They didn't bleed through to the next page. So tomorrow, when we read our next article, students won't be distracted by today's highlighting. 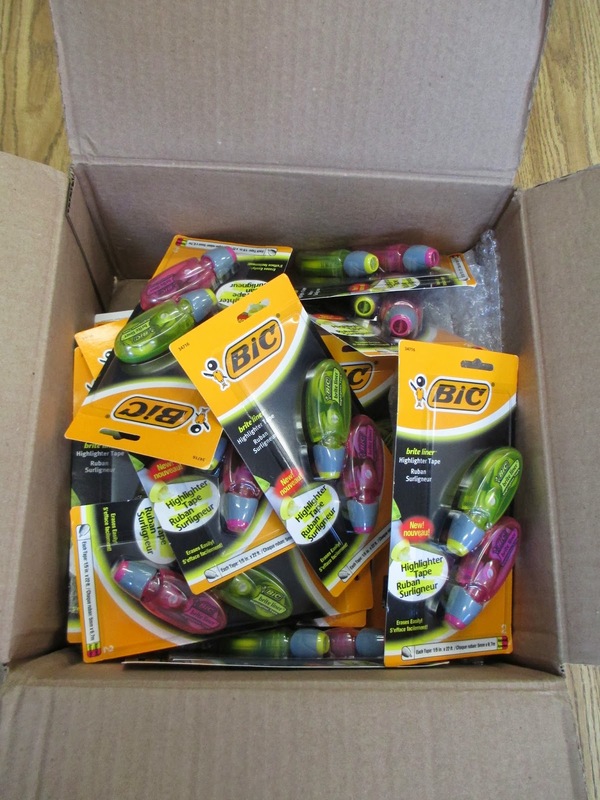 Bic has offered to give away 5 of their Brite Highlighter Tape packs, one to each winner! Enter with Rafflecopter below for your chance to win a package of Bic Brite Highlighter Tape. I would love to use them in much the same way you did, particularly in science class. I would use them to prepare for our state testing since the students are allowed to use highlighters on it. I would also probably use it during any research project we do. I would allow the students to use them for when they read magazines. I LOVE the fact that it can be erased! I would use the high lighters while reading Science. I do a lot of Common Core deep reading activities with our content area reading. These are AWESOME!!!! My sixth graders would really get into these. Thanks for the opportunity to try to win some. They would be great to use when we UNRAAVEL reading passages and math word problems. I would use these during guided reading and strategy groups, especially for close reads. It might be good to use to highlight specific words in math word problems. Thanks for the opportunity.